Heaven exists, and we have found it. Think about how your perfect day would go. Chances are it would involve lying on a beach on an island somewhere, right? How about if I were to throw some puppies in there for funsies? Yep, that'll do nicely. Well, we live in a world where dreams clearly do come true guys, because on the island of Providenciales in Turks & Caicos there are a ton of rescued dogs ready to be adopted. RIGHT THIS MINUTE. 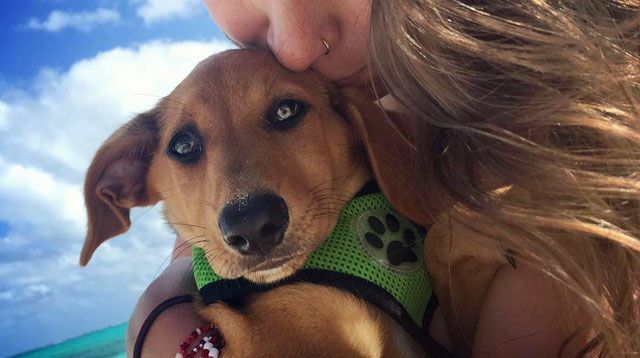 Potcake Place is a charity dedicated to re-homing rescue "potcake" pups—a mixed breed of Labrador Retriever, German Shepherd and English Fox Terriers—that's currently overpopulated across the Caribbean. And they're VERY good boys and girls! The shelter is run by volunteers and has 50-70 dogs at any time. They make sure that the pups get their vaccinations, and can even help arrange certificates for travel. They say "If an adoption goes ahead, we help book the pup on the plane, and meet the families at the airport." And even if you're not quite lucky enough to be able to adopt one of the puppers, the charity says you're more than welcome to visit, because its animals benefit hugely from social interaction with humans. To adopt a Potcake puppy, you need to be over 25 and willing to commit to your new family member for 10-15 years. Adoption is free, but they ask for a donation. I'm in. I am SO in. How about you?